HCT Group is a social enterprise in the transport industry. Our story starts in 1982 with the formation of Hackney Community Transport, providing low cost minibuses for local community groups – a service we provide to this day. In 1993, with traditional grants under threat, we came to the realisation that the best way to become a sustainable social enterprise was to become an effective enterprise. We began to compete for commercial contracts in the marketplace to ensure we could continue to provide community transport. This approach has seen HCT Group grow from a handful of volunteers and a couple of minibuses, with a turnover of £202k in 1993 – to a large scale social enterprise with 1500 employees, more than a dozen depots spread across London, Yorkshire, the Southwest, the Northwest, Derbyshire and the Channel Islands, a fleet of 730 vehicles and a 2017/18 turnover of £62.9m. Our commercial track record spans a wide range of services – from London red buses to social services transport, from school transport to Park and Ride, from community transport to education and training. 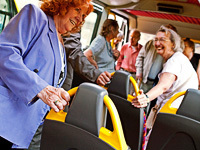 We now deliver over 30 million passenger trips on our buses every year. You can find a full breakdown of the services we provide across the group here. We are continuing to expand our services, aiming to win new business, undertake new projects and grow into new areas. This is not growth for growth’s sake, but because the better we do commercially, the more we can do socially – commercial success enables our community impact.